Bike Pic Nov 6, did you get out and vote to do your part? This Bike Pic Tuesday it’s Election Day! If you haven’t already, please do your part and cast your ballot to help keep our democracy intact. Then you too can rest assured, when the weather warms up next summer, you will continue to have the freedom to ride your bike across the U.S.A. or maybe the Iowa countryside on RAGBRAI. What better way to continue your biking fun and your #NextBikeAdventure. View all the great ideas and bike destinations in the latest Iowa Bike Guide and Minnesota Bike/Hike Guide. Then plan your next outing with family and friends in one of Minnesota’s HaveFunBiking Destinations. 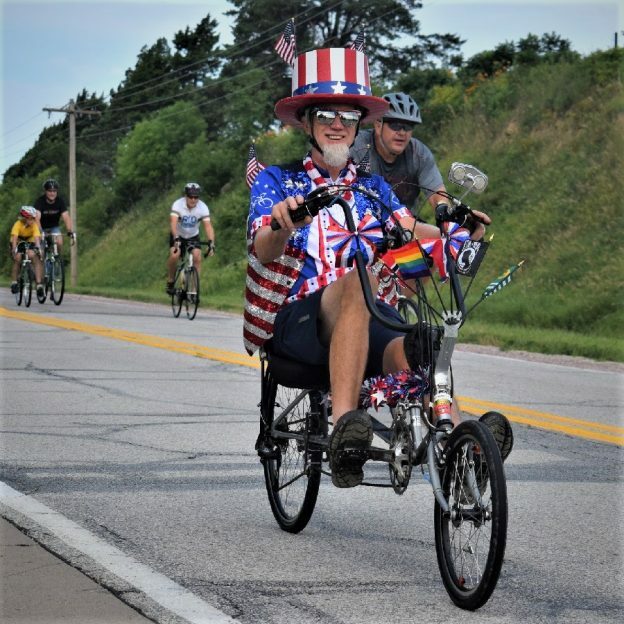 This entry was posted in Picture of the Day and tagged Across Iowa, Across the U.S.A, bike guide, biker dude, Election Day, Free maps, Freedom, Get Out the Vote, GOTV, Iowa, picture perfect, RAGBRAI, ride right, road biking, touring, Uncle Sam on November 6, 2018 by Russ Lowthian.